The comprehensive 21Vianet ecosystem just became stronger following a strategic co-operation agreement with Haihangyun, a one-stop provider of cloud computing services which is wholly-owned subsidiary of the China-based HNA Group. This year, 21Vianet has joined a powerful grouping of strategic 21Vianet partners that boasts Aliyun, Qcloud, Baidu Cloud, Ksyun, Jcloud and Tongfang Cloud, as well as other major enterprises in China. 21Vianet is joining forces with Haihangyun to build an open, stable and secure infrastructure that will facilitate development of hybrid cloud and blockchain distributed database solutions. Being the globally influential provider of network infrastructure service, 21Vianet is committed to offering leading data centre service, neutral cloud operation, neutral hybrid IT service and CDN service. This co-operation agreement brings together 21Vianet’s globally influential leadership network infrastructure service in data centre, neutral cloud operation, hybrid IT and CDN services. 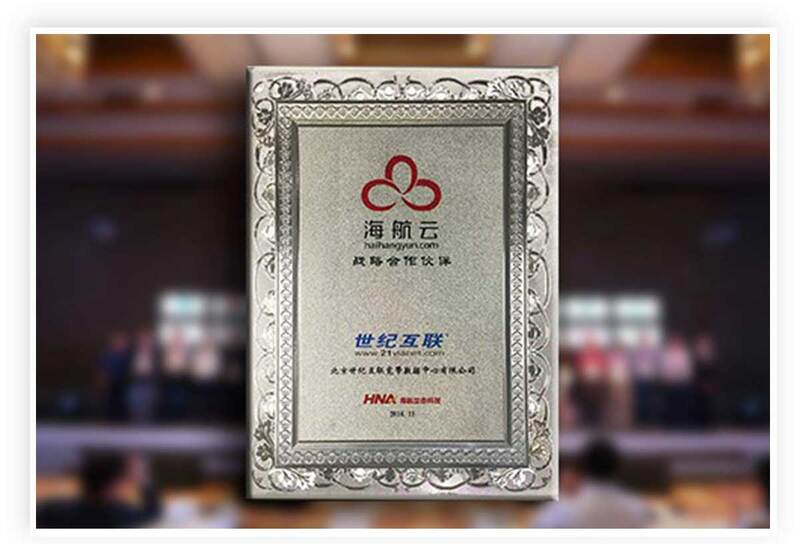 In addition, as the important carrier of HNA EcoTech Group’s connection and open strategies, Haihhangyun has competitive edges with its rich industrial data, comprehensive commercial ecological chain, sufficient operating capital and other field. Together, 21Vianet and Haihangyun will enhance the added business values of enterprises, customers, resources and data. This partnership will leverage on both parties’ advantages to pinpoint the security weakness of user cloud by integrating each other’s strengths in products, technologies, solutions and services, providing state-owned enterprises and government departments with self-managed and customizable hybrid cloud solutions. This partnership aims to create more professional, customized and diversified cloud services in order to meet the increasing demand for cloud and information security in China. Drawing on 20 years’ experience in provision of Internet data centre services, 21Vianet, with its expanding data centre, helps customers build low-cost, highly-capable and self-managed networks for different scenarios, achieving the interoperability between networks, and among different service providers. 21Vianet is China’s first cloud computing service provider with world-class technologies. Besides, in order to explore the disruptive innovation between network infrastructure and online finance, 21Vianet has developed underlying protocol, Blockchain Plus, with an attempt to achieve the “fragmentization, digital contractization and P2P transaction” for its IDC assets, making each server a micro data centre, and to combine the Internet of Things with blockchain protocols. The HNA Group, one of the world’s top 500 diversified industrial group, leverages its unique coverage across different industries to combine its physical and virtual resources to form an industrial ecology. The HNA Group dedicates its efforts to achieve industry digitization to form an open ecological platform, enabling its partners and customers to share ecological values while helping young entrepreneurs to start up their business. Haihangyun is an organic, multi-leveled ecosphere consisting of technology, application and industry. The ultimate target customers of the entire ecosphere are those from the government and innovation teams, with an aim to provide industrial cloud services and solutions empowered by the industry, data and capital.